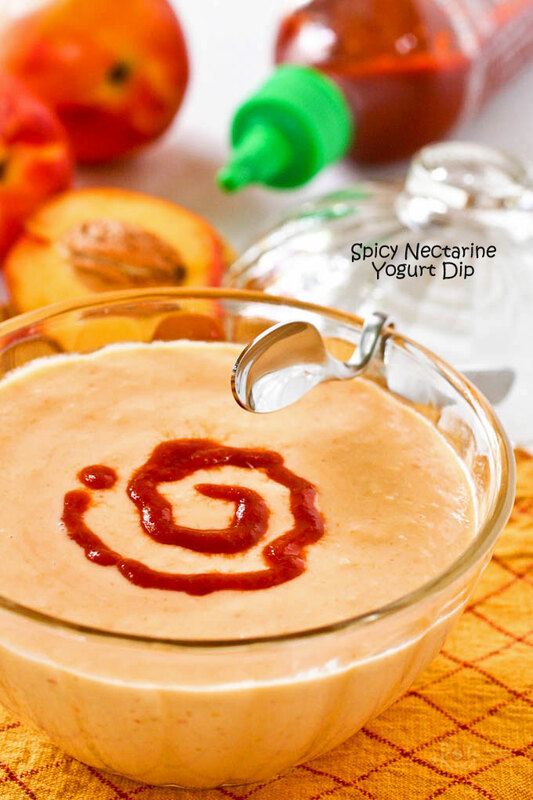 Light and fruity Spicy Nectarine Yogurt Dip spiked with Sriracha sauce. Delicious served with grilled meats, veggies, and chips. Wow, I finally got round to making another dip for this blog! Up until now, the only other dip found here is this Satay Peanut Sauce which was made for the Turkey Satay in the post. From now on, you should be seeing more dips and sauces. As such, I have created a separate category for it filed under “Courses/Dips & Sauces” in the drop-down menus above. It is a long time in coming but I think you will not be disappointed with this light and fruity Spicy Nectarine Yogurt Dip. It goes really well with grilled or roasted meats, veggies, and chips. Stone fruits like apricots, peaches, nectarines, and plums are starting to emerge as the weather gets warmer and warmer. So far, I have already tasted apricots in the form of a delicious smoothie. The recipe should be coming out soon. Two weeks ago, I bought some nectarines. Since they were not quite ready to be eaten, I left them in the fruit basket to ripen. When they did, I used them in this amazing dip which looks like a smoothie. I absolutely adore its fresh fruity taste. I used thick and creamy plain Greek yogurt combined with onion as the base for this dip. 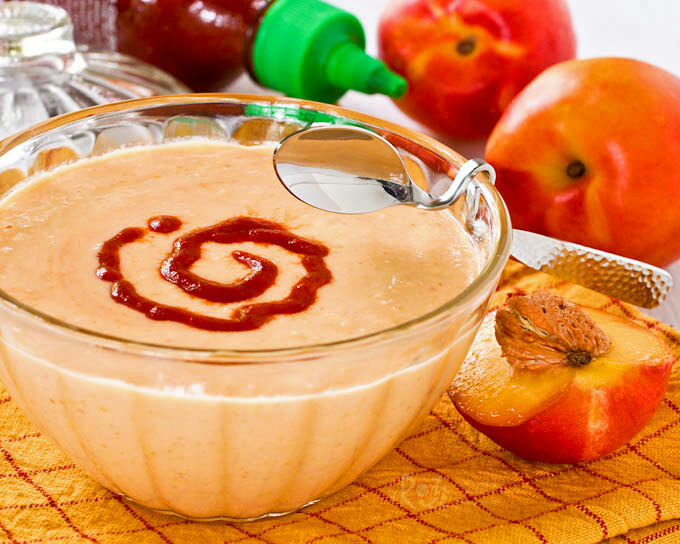 The nectarines gave the dip a fruity and slightly tangy flavor while the Sriracha sauce gave it a hint of spiciness. It was then rounded off with a tablespoon of raw honey. Please feel free to adjust the level of spiciness and sweetness to your taste. 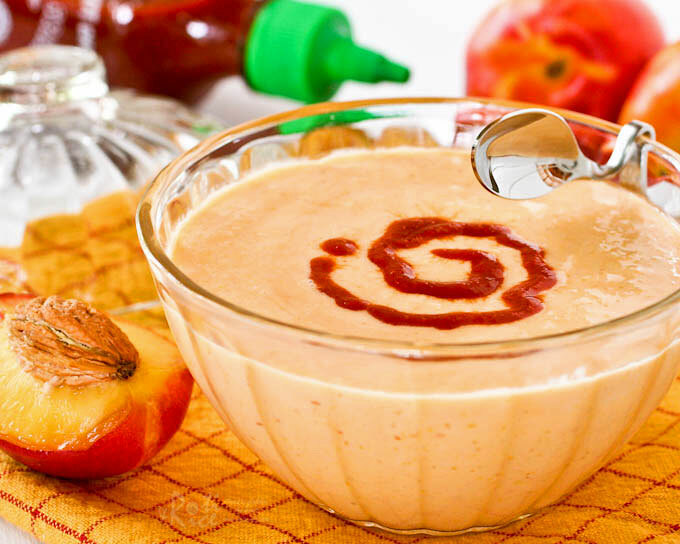 Combine yogurt, onion, nectarines, Sriracha sauce, and raw honey in a blender. Blend until smooth. Remove and keep refrigerated until needed. 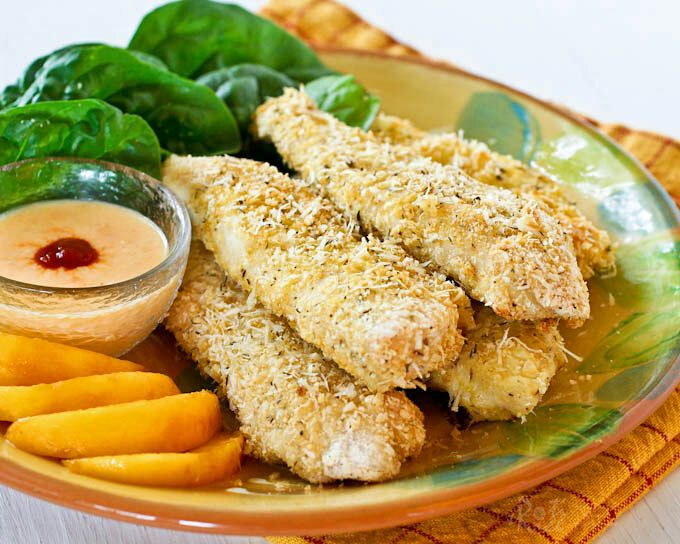 Update: The recipe for Gluten Free Baked Chicken Tenders has now been posted. Love the sweet and spicy to this dip. YUM! What a unique dip! I love nectarines, peaches, any fruit with a pit. Never thought of turning it into a dip however. Love the idea and the “spicy” definitely gets my attention! Looks wonderful! The little bit of spiciness helps bring out the sweetness in the dip. I like it and will be experimenting with more fruity dips in the days ahead. I like the dip spoon that hangs on the rim of the bowl. Where can i buy it? Thanks. That is a Villeroy & Boch espresso spoon. My hubby purchased it in Germany.